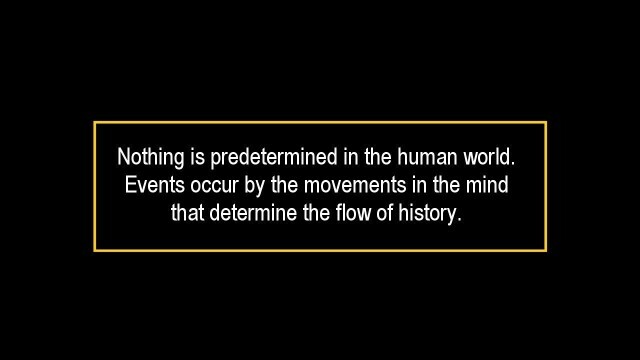 ** Nothing is predetermined in the human world. that determine the flow of history. The American Revolution had three major node points in its history. At the opening node circumstances forced an intention in society to seriously consider independence. 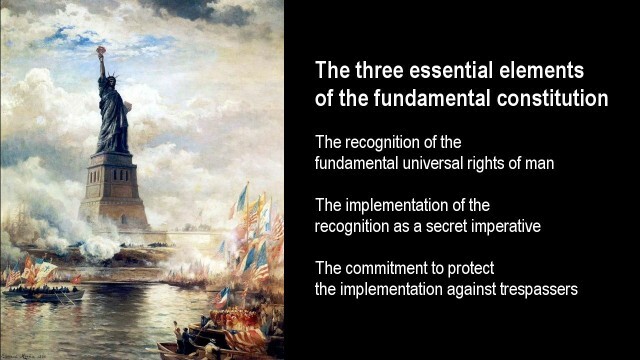 The second node is the formal declaration of a fundamental constitution of the basic universal rights of man that served as a high-level recognition for the founding of a New Nation. At the third node the established nation gave itself a legal face and a platform of understandings for its operation in the form of a Federal Constitution. 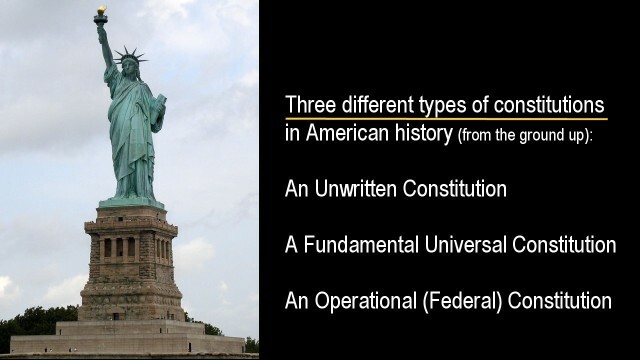 We deal with three different types of constitution here: an unwritten constitution, a fundamental universal constitution, and a detailed operational constitution. Its opening node exploded as a revolt against the tax looting of the American colonies by the British Empire who claimed the colonies as property, instead of as a society of human beings. To the colonists, the resulting attitude and despotism by the masters of empire became increasingly intolerable. 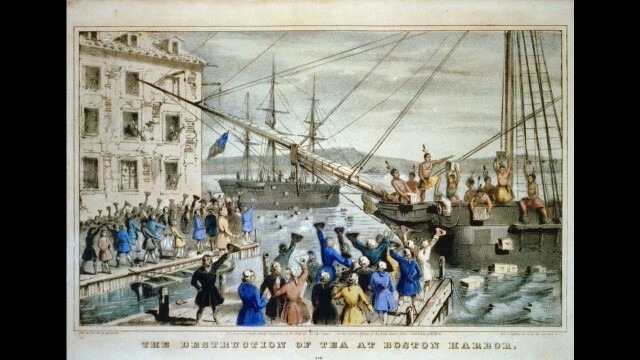 In the flow of the high-handed humanist regression, the famous Boston Tea Party revolt happened, where a large amount of British Tea, for which taxes were due on arrival, was dumped into the brink in 1773. A movement had begun that changed the world, that not even the King could turn back. The colonists had demanded that a fleet of British tea ships turn back home without unloading and without collecting taxes. In a number of cases the ships did turn back, from places where the colonists had inspired the appointed consignees to resign. But not so in Boston, where the ships were actually prevented from turning back. At this point the colonists drew a line and built a gate on it, and said to the masters of empire and all its men, 'you will not pass - the portal of our tolerance is closed. The colonists, in disguise as native Americans, simply boarded the tea ships and dumped the to-be-taxed tea into the ocean so that the line they had drawn would not be crossed. An iron gate had been lowered against the empire a d its adherents from this day onward. 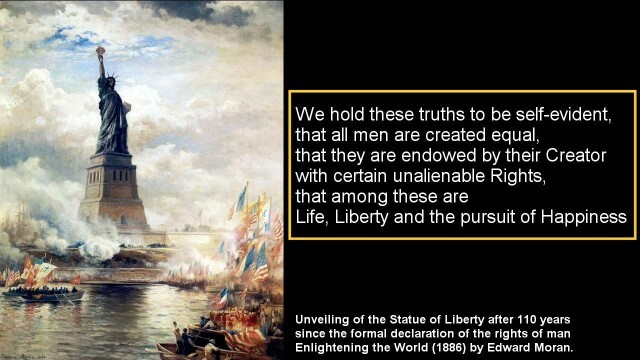 The people in the colonies had a vision of the common dignity of man that was worthy to be protected. Thus, they simply erected a gate against empire and its stooges, that should never be violated. The line for the gate was drawn officially on the line of the basic democratic principle of "no taxation without representation." 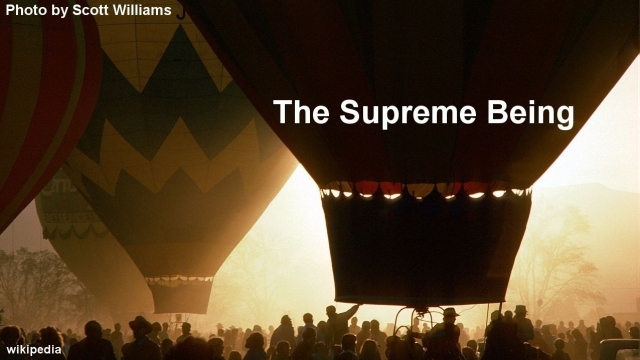 The gate, in the form of this basic principle, was set up against the invasive force of the system of empire. No constitution was written up at the time as a basis for self-protection. But the idea for it was in the heart. The masters of empire, of course, were enraged. 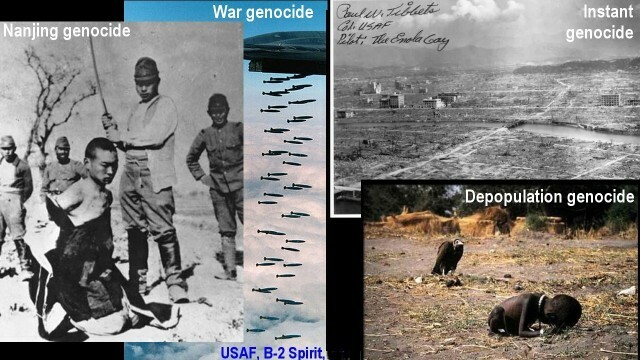 "Crash the gate, reverse history, and punish the keepers of the gate," was the imperial response to America. Intolerable acts followed. The empire answered with abuses upon abuses to break the rebellious spirit. In modern time it would be called, "teaching them a lesson." It would be delivered in a manner that it would be understood by the colonists, namely that resistance to empire is futile. The colonists, however, learned this lesson differently, which changed the course of history. The Boston Tea Party was evidently but the culmination of a long string of abuses of the power of the empire that claimed the right to subject society to its will. The lesson that the colonists learned was, that empire will never willingly yield to any line drawn by the people, but is fully committed to crash every gate that should every be erected against its will. Thus, the lesson that the colonists had learned, essentially defeated the empire's own cause. 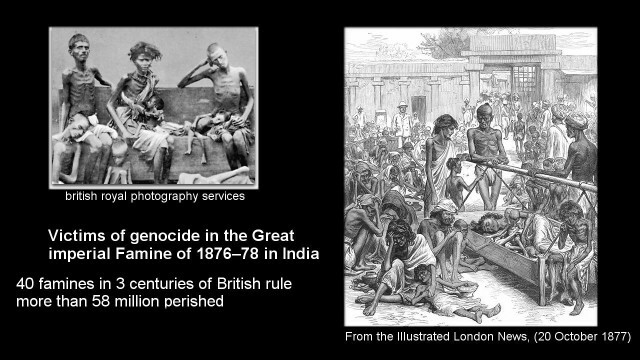 The harsh reaction of the empire against the colonies inspired a debate in society. The politically docile population suddenly awoke and became active and self-inspired with discoveries of what a human being is, what a society is, what a civilization is, and so on. 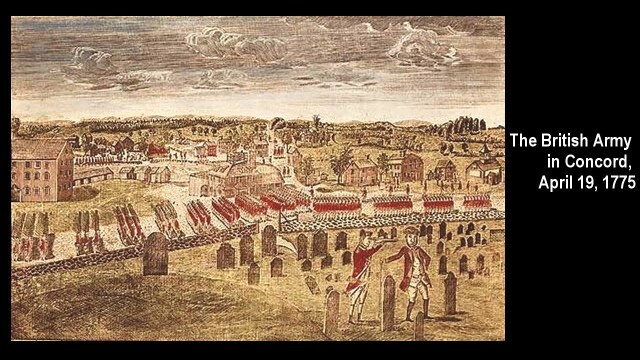 The colonists formed a militia to protect themselves against the British punishment. The British Parliament in turn declared in February 1775 that Massachusetts is in a state of rebellion. It answered with war - war to disarm the militia, which is cited in history as the start of the American Revolutionary war. 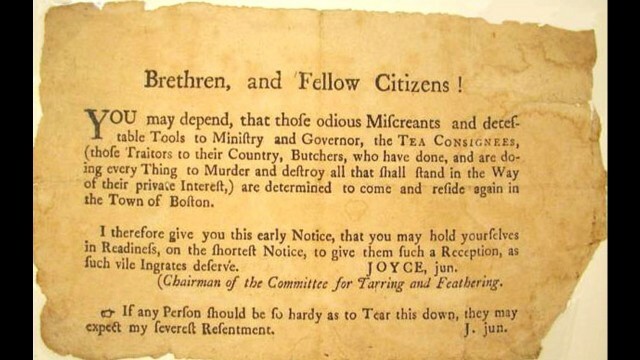 The tea party, by then, served as a mobilizing identifying symbol for the revolution movement. 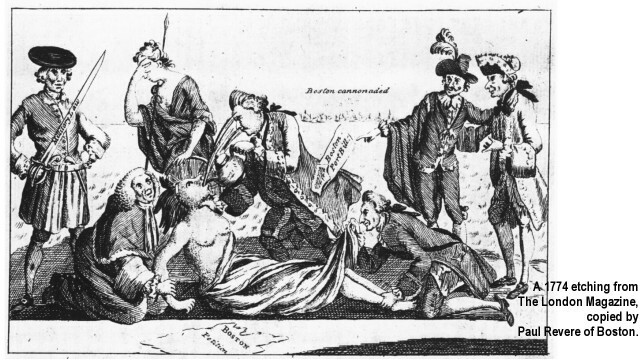 The posters shown here, of a 1774 etching from The London Magazine, which was copied by Paul Revere of Boston for his rallying call, depicts an American woman having British tea forced down her throat. We see the British Prime Minister Lord North, author of the "Boston Port Act" that closed the Port of Boston for any form of commerce, forcing the British Parliament's punitive 'Intolerable Acts' down the throat of America, whose arms are shown restrained by Lord Chief Justice, Mansfield, while Lord Sandwich pins down her feet and peers up her robes. Behind them, Mother Britannia weeps helplessly. Quite early in the tumultuous flow of imperial madness, at the time when the great public discussions occurred as to what to do, as a step in this direction a Continental Congress of all American colonies was convened. The congress formulated a petition to the king, to stop the madness and reprisals. 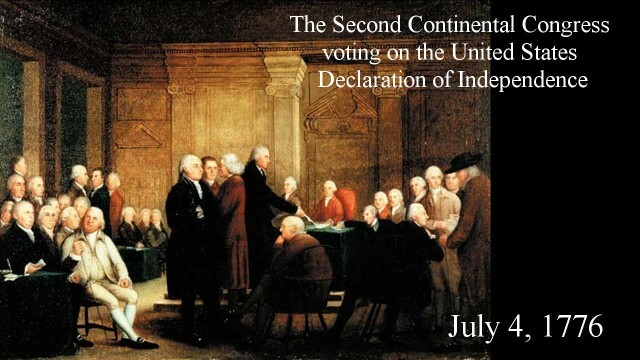 A second Continental Congress was required to convene in 1775 if the king failed to comply. Of course, instead of relenting, the King gave America the finger. In response to the finger the revolutionary war had already begun when the second Continental Congress convened. 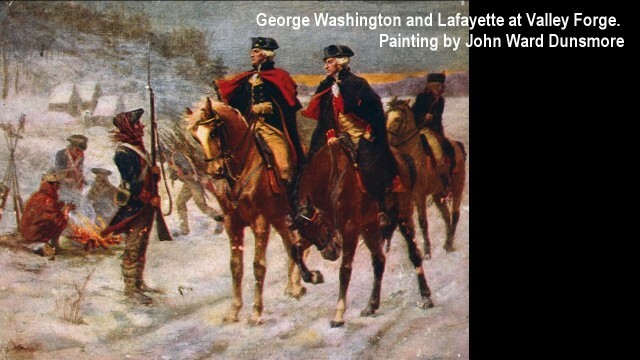 As its first major act, the Second Congress created the Continental Army out of the ad-hoc militia units around Boston, and appointed Congressman George Washington of Virginia as the commanding general of it. It also extended the Olive Branch Petition to the British Crown as a final attempt at reconciliation. However, it also reopened all American ports in defiance of the British Navigation Acts. While the Continental Congress had no explicit legal authority to govern, the Congress quickly assumed all the essential functions of a national government on the basis of the unwritten fundamental constitution in the mind of society of the recognition of the fundamental universal rights and freedoms of man that had established a line in the mind, in society, with the Boston Tea Party, that the people had demonstrated, no one may cross. In the course of the continued continental discussion, a notion was put forward for the colonies to unite and form a single nation that is dependent on no one but itself, as the recognition dawned that a human being is greater than a king. A draft text for a resolution was prepared by a committee of five of the delegates to the Congress. 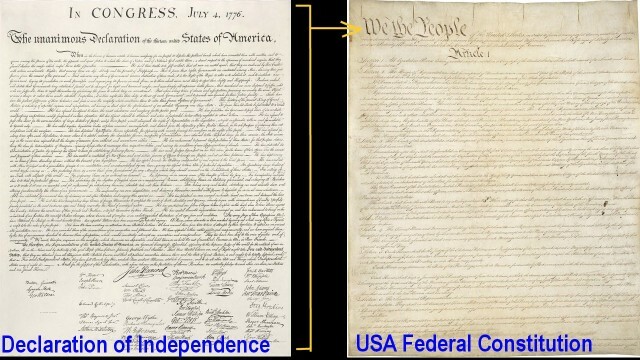 The drafted concept in principle, was voted up as a resolution, which became known as the Independence Resolution. More than 30 months had passed at this point since the Boston Tea Party patriots had proclaimed its understanding in an unwritten constitution. This was about to change. In two days of discussion in Congress the draft was revised item by item into the final document that stands today as the new nation's guiding star. 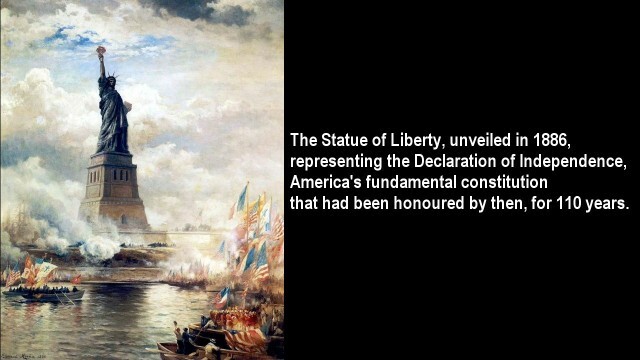 The final version was voted up on the 4th of July 1776. The result of the two days of discussion before the affirming vote, established a fundamental constitution that declared in writing the principles that the new nation recognized itself to be founded on. The Declaration of Independence no longer petitioned the king for concessions. The nation declared itself to be free, complete in itself, and sovereign above the claims of any king and prince and empire. The voted up document states an established fact, and serves to the present day as a fundamental constitution on which the nation stands founded. Of course, a copy of the finished document was also forwarded to the British king, informing the king that the colonial status in America existed no more. It was saying to the king, the world has changed, there is nothing you can do about it, so let it be. The finished document was also saying to the whole of humanity that a fundamental constitution for civilization has been established after years of deep-reaching struggles and fundamental recognitions, which stands established as the light upon a hill from this day forward. 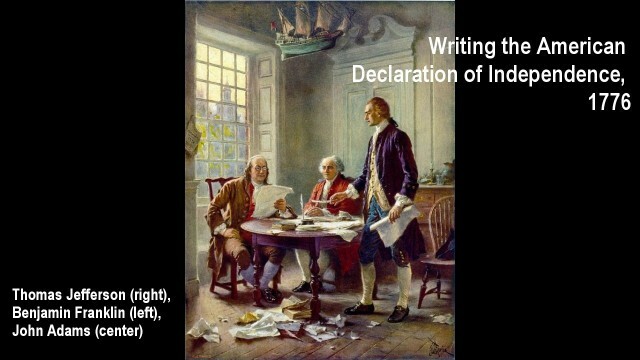 The document became known in history as the American Declaration of Independence. In its spirit, however, it is an American document only in as much as it was pioneered in America, while it stands in principle for all humanity and civilization, similar in nature and purpose to the great Principle of Westphalia that was established in 1648, which laid the foundation for a higher-level civilization from this time to the present. The Declaration of Independence and the Principle of Westphalia are both revolutionary for the simple reason that they finally acknowledged in writing formal agreement what had already been known and established in the heart. The revolution was, that they invoked a long recognized invariable truth. The revolution is in the spirit that states that the People of Humanity have fundamental rights that no one may violate for any cause or any reason; that the full recognition of it establishes a line that no one may cross; that it sets up an iron gate on this line that no man, king, or government may compromise. The Declaration also defines the nature of the ruler of the gate, a government that establishes in law the recognized fundamental principles. It states, that "to secure these rights, Governments are instituted among Men, deriving their just powers from the consent of the governed." 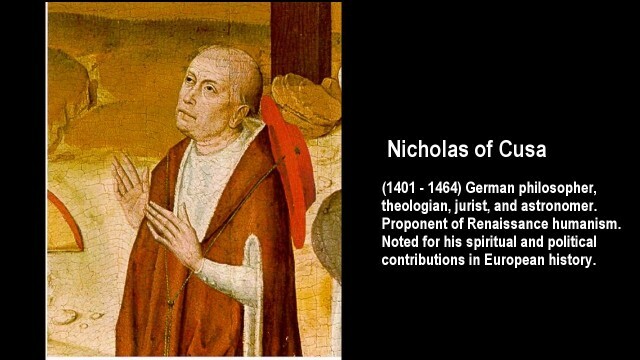 The declaration states that the high-level fundamental recognition has no effect if it is not implemented in deeds, or allows contrary deeds as in the case of empire. In 1776, the king of the empire became enraged by the declaration of the fundamental principle of humanity. He called it a rebellion. The document that declares the independence of humanity also establishes in principle the office of the keeper of the gate. It acknowledges that humanity, as a civil society of human beings, must consciously serve as the keeper of the gate behind which civilization and the common welfare of humanity stands protected and the internal development of a nation, or nations, becomes possible. It declares in essence that without this ongoing commitment, the revolution in thinking becomes meaningless. 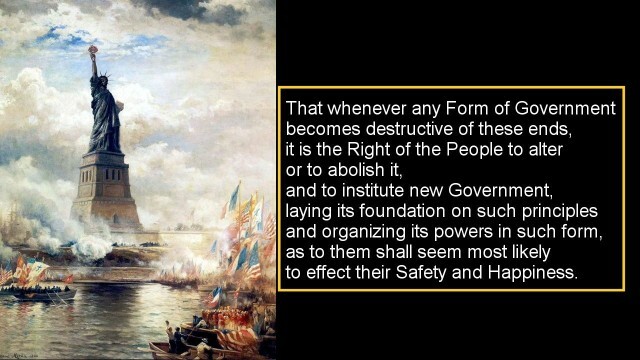 Its document states: "That whenever any Form of Government becomes destructive of these ends, it is the Right of the People to alter or to abolish it, and to institute new Government, laying its foundation on such principles and organizing its powers in such form, as to them shall seem most likely to effect their Safety and Happiness." The document acknowledges too, that "Prudence, indeed, will dictate that Governments long established should not be changed for light and transient causes; and accordingly all experience hath shewn, that mankind are more disposed to suffer, while evils are sufferable, than to right themselves by abolishing the forms to which they are accustomed. 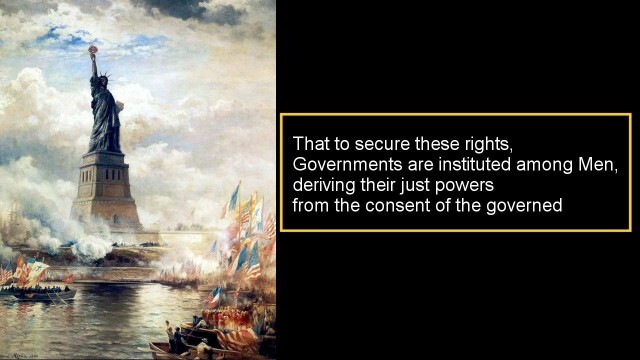 But when a long train of abuses and usurpations, pursuing invariably the same Object evinces a design to reduce them under absolute Despotism, it is their right, it is their duty, to throw off such Government, and to provide new Guards for their future security." The recognition of the fundamental universal rights of man must be rooted in the heart and never fade. The implementation of the recognition must flow from the heart as an enduring imperative. And the intention must never diminish to protect the universal rights of man against anyone who is, or would be, a gatecrasher who would usher in a new dark age of fascism in the world. The document declares that the highest recognition of humanist principles has erected a gate that no one may cross who does not subscribe with honest heart to the spirit of its high-level principles that were discovered in years of great struggle, which establish the fundamental rights and duties of a human society for all times to come, which constitute the fundamental right of man as a precious achievement that must be kept precious by constant vigilance and care so that it may not be marred or fall to the ground and be lost. 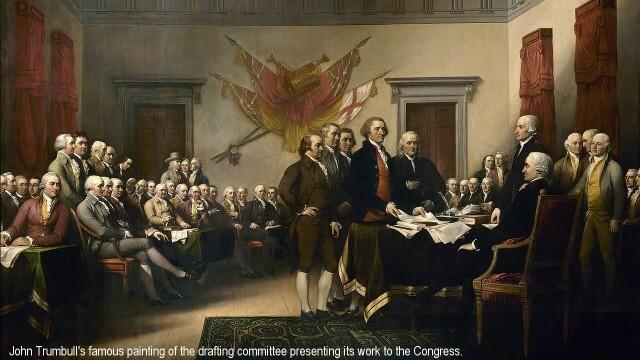 The final formulating of the Declaration of Independence was performed by the Continental Congress over the span of two days in intense discussion before it was voted up to be adopted as the guiding star for the future of the nation. With this action, the Continental Congress took on the role of the first gatekeeper, and in this role as gatekeeper it affirmed that the people of America had done their home work to qualify for their stepping to higher ground that would make tall demands in thinking for the people's requested freedom to become possible, and to be maintained, because, as the Congress may have realized, which evidence suggests, that a lot of trash and heavy baggage had been removed from the mental landscape across the nation in the preceding 30 months of public discussion. Congress had recognized that the nation, from this moment on, was qualified for the higher-level national existence that it was seeking, where the measures of the Old World did no longer apply. "But can the nation keep itself' rooted at this higher level;" Bejamin Franklin may have asked during the discussion. "Is the nation qualified to keep the republic in the heart and maintained and protected for all times to come?" He may have implied that a people having passed the test once does not mean that the people after them will keep up the work? Benjamin Franklin might ask us today in our world of crisis, "Will you dedicate yourself again to become able gatekeepers?" The last question is critical, because to answer well, rules out the gatecrashers such as those in history who have inflicted enormous damage in our world. The gate crashers still are many, who have bullied their way across the gate without their intentions and actions being qualified for any position of power in a human society. The Nazi machine engineered its rise to universal acclaim by the failure in society to keep the fundamental constitution of man in the heart and protect it as able gatekeepers. The gate crashers had caused en entire society to crash that evidently no longer knew what a human civilization is, and what a human being is, though they claimed the right to rule them. 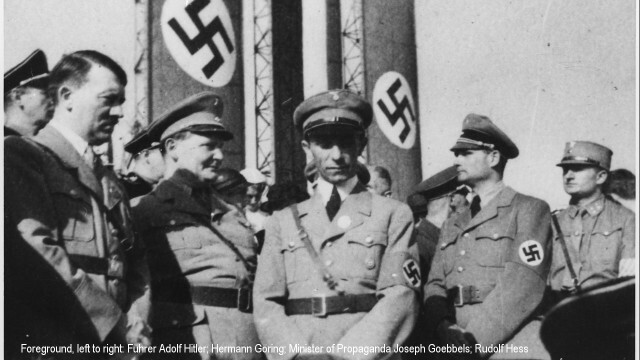 Adolf Hitler was a glaring example of a gatecrasher. He destroyed what he touched and then killed himself. 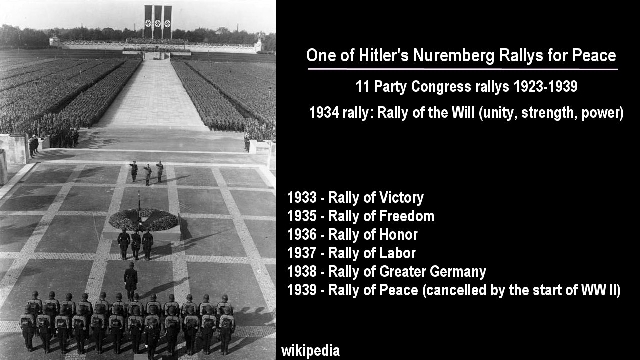 He was one of many of this breed that includes some of the most famous names in history, like the Roman Emperor Nero, and includes in the modern world a wide assortment of traitor presidents and kings, and financiers and oligarchs, who champion the Hitler moustache by their deeds. Some, in their small-minded blindness toy with visions of insanity that inevitably bring the house down over the heads of humanity, such as with a nuclear war that entails absolute mass-destruction by which all life, potentially, becomes extinct. No leader, no matter how great in power, has the right to incinerate the Earth, which is the collective home of all human beings, nor gives the fundamental constitution the right by design to any man to harm a single person for any cause, profit, or ideology. The line has been drawn. The gate has been erected that no one should crash. Of course, not all the gatecrashers are as radical in their insanity. 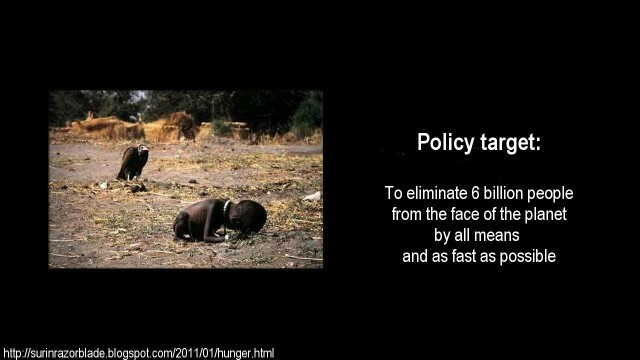 Some advocate that only 6 billion people be killed, and that this be done by silent means such as burning their food and depriving the world of its energy resources, and other means to exist. Their policy is to depopulate the world to the low levels that have historically enabled feudal systems to operate as a stable platform of universal poverty. 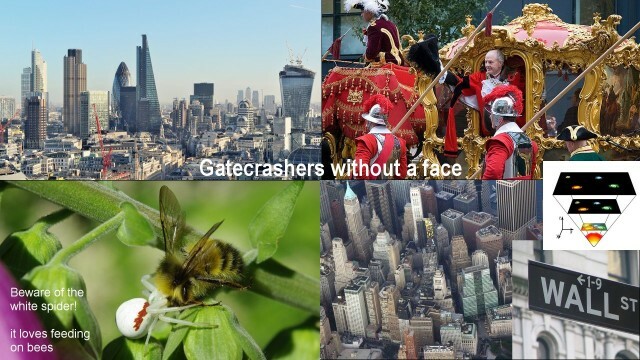 Other gatecrashers are more specific. 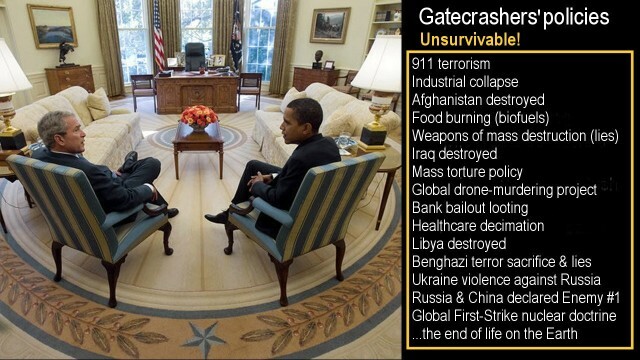 Their stated objective is to destroy all sovereign nations from within by inspiring society to decimate its own industries, health care, and the banning of all vital energy resources, as evil demons, including its food that society now burns in cars in volumes that would normally nourish upwards to 400 million people. Thus, instead of honouring the fundamental rights of a human society, society has become gatecrashers itself against its own most basic constitution. The gate-crashers are many now. Most stand without a face, hidden behind the facade of institutions, oligarchies, and monarchies. Nevertheless, while most have no recognizable face in the jungle, each one by itself is far too dangerous not to be vacated from the land of civilization, for civilization to survive. 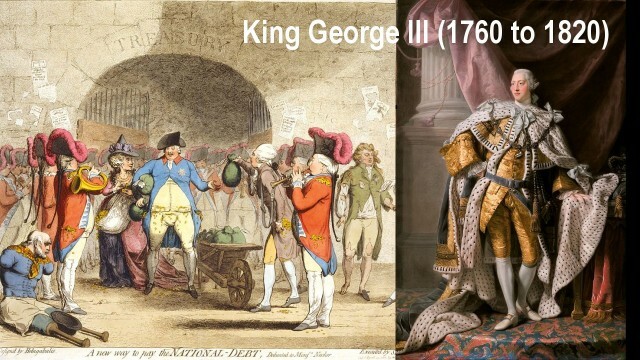 As one might expect, the little man on the throne of Great Britain in 1776, when the fundamental constitution was voted up in the USA, chose to be a fool and dedicate himself to the role of a gatecrasher. The pathetic little man was totally unqualified to be king under the established constitution that set a new and higher-level standard for a human society, which the king's little mind excluded himself from. As the little man that he was, he chose to act as a gatecrasher and forced many thousands to die in his futile war to protect a corrupt system that was even then already essentially dead. As a gatecrasher the king activated his entire circus of little men that termed itself an empire, which collectively spit on the hard-won fundamental constitution of the New American Nation, by declaring the constitution to be a rebellion that must be crushed. The War of the Gatecrasher thus begun. It was the war that the circus of the gatecrashers had brought against America. This war should have been avoided. 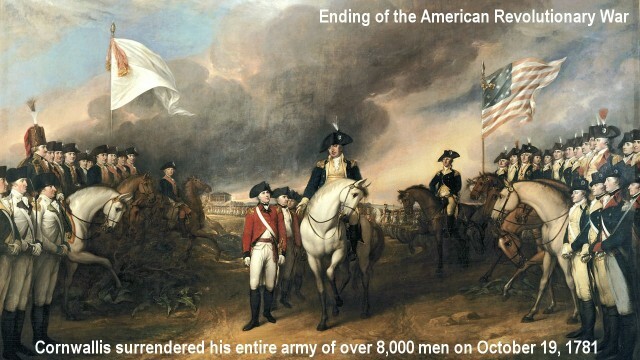 It should not be called a revolutionary war, because the revolution had happened before the war began. In the ensuing war of the circus of little minds, the achieved revolution was defended, often against nearly impossible odds. The War of the Gatecrasher was rebuffed in a America in the course of a long armed struggle. The rebuff was not easy, but it was won in the spirit of the new constitution that upheld the dignity of the human being and its profound right to life, liberty, and happiness. This core recognition now documented as a constitution was the nation's line of defence. On this line the new nation stood at the gate it had erected and grabbed the lion's beard, looked into his eyes and said emphatically, you will not pass, turn back. In this war, the nation became its gatekeeper, and it succeeded. 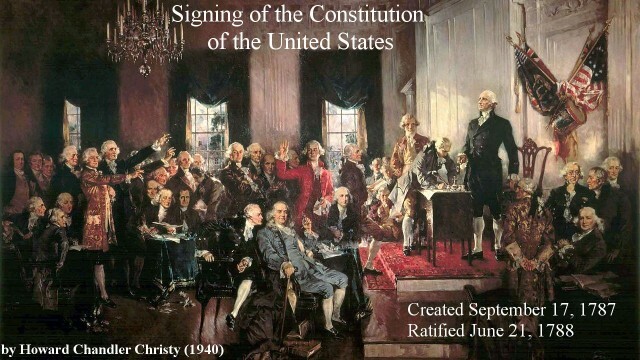 The subsequent formal establishment of a Federal Constitution for the USA, after the war of the gatecrashers had been defeated, did not replace the fundamental constitution that the nation was founded on. The Federal Constitution became in essence, a supplement of it. 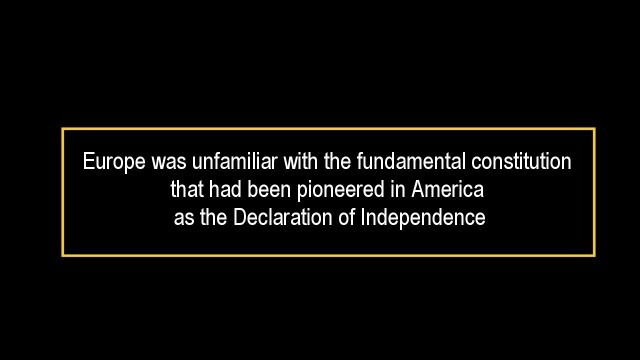 It did not overturn the fundamental constitution of the Declaration of Independence that founded the USA and defended it. It merely gave it a wider expression in specific articles of law and gave it a legal name and established a formal federal government. The Federal Constitution, did however, replace the Articles of Federation that established a platform in 1777 for the nation's Congress to mount an effective defence in the war of the gatecrashers against America's inner revolution. With the Federal Constitution the nation declared itself to be rooted in the fundamental constitution that put the focus on the rights and dignity of universal humanity, that the Federal Constitution stands subsumed to with the phase, "We the people." 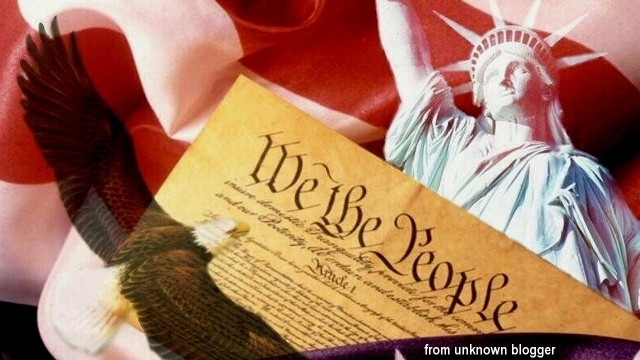 The phrase, 'We the People' points back to the Declaration of Independence as a fundamental constitution that the nation had been founded on, which had documented the principles for its existence. This means that the fundamental constitution still stands. It means that anyone crashing its gate, from without or from within, violates the most basic constitution of the land, and of humanity as a whole. It also means that it is still society's task to evict any gatecrasher from the fabric of its civilization. 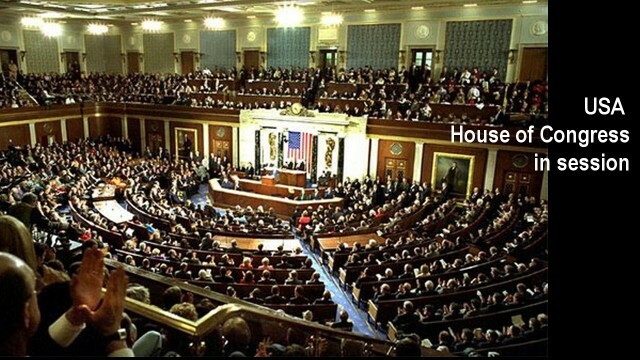 Under the Federal Constitution the task to evict the gatecrashers from within, is specified to be carried out in the House of Congress by a process of impeachment by trial. However, above the Federal Constitution and its models stands the fundamental constitution that affirms society's role as the keeper of the gate, which thus shoulders the duty to act as the ultimate protector of its life, liberty, and happiness, by whatever means may be required depending on the severity of individual situations. The fundamental constitutional principle comes into play only in practice, when the Federal Constitution has been fouled up with corruption to the point that it no longer functions under the repeated assaults of gatecrashers upon it who pursue their own agendas. Under the Federal Constitution all elected officials, from congressmen to the president, are employees of the people, and are on this basis subject to dismissal from the job for non-performance, incompetence, incapacity, betrayal, or serious offenses. 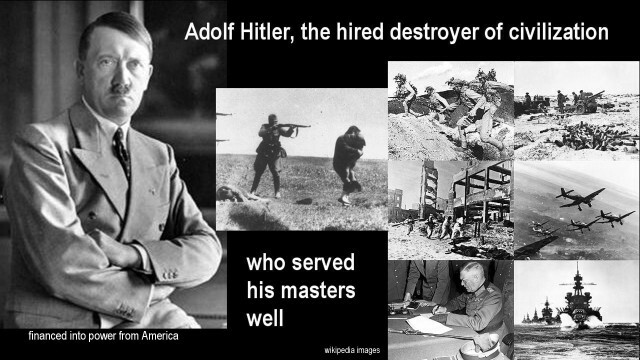 In the case of Adolf Hitler, much of the world was destroyed, because society failed itself by neglecting its duty as the gatekeeper. The same is presently unfolding, to be happening again, and for the same reason, and this time with vastly more-devastating consequences that no one will likely survive. 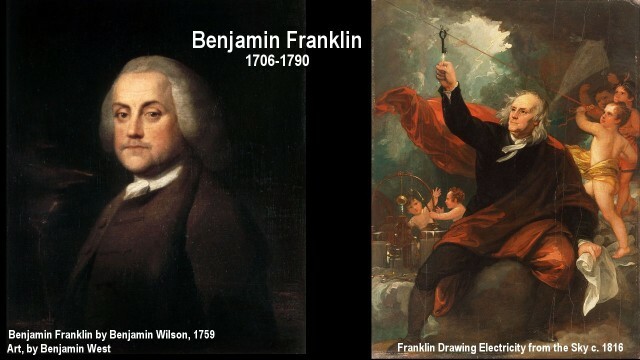 Knowing this type of potentially deadly exposure, one of the founding architects of the USA, Benjamin Franklin, a man known for his exceptional insight, is reported to have said, 'I give you a republic if you can keep it.' He should have added: If you cannot master the challenge, you will end up with fascism, even extreme fascism. Every mental landscape that is full of what is not true, that is full of what is not intrinsically human, collapses into fascism that often affects the entire front of civilization. That is where we are today, still. Benjamin Franklin should have further stated: The republic and the keeper of the gate are One, and this One is civilization. The two exist together, or they don't really exist at all, because the alternative is hell. When the heart is dead, the republic dies, civilization vanishes. That's the definition for hell. The path for redemption is obvious then, isn't it? It begins with the healing of the heart. The healing of the heart unfolds when society finds enough value in itself that hasn't been smothered with trash, so that society will man the gate and become the keeper of it, actively. This is the principle of the gatekeeper. This principle was understood in American history. It was heeded in times of great crisis. It was also honoured for a long time therafter. 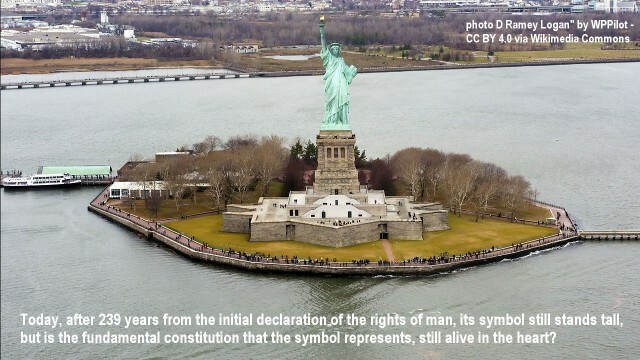 A giant statue was built in honour of the freedom inherent in the fundamental constitution. 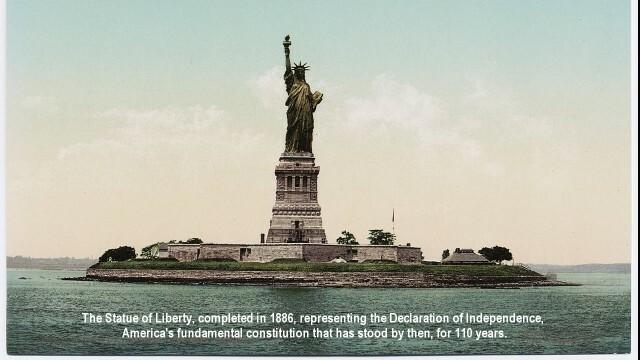 It was built 110 years after the freedom constitution was established. America's fundamental constitution, as a memory has withstood the test of time and may be so honoured for evermore. But will it be honoured in life and in truth? When society honours itself as the diamond in the sky of life, it becomes possible on this basis to build a great nation, and impossible for any gate crasher to succeed and soil the fabric of that nation. 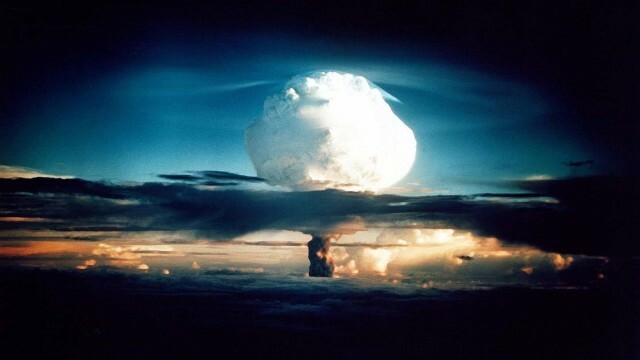 The insanity of nuclear war, which means universal annihilation, will not be possible then when the fundamental constitution is rooted in the heart, so that the gatecrashers who threaten the world today won't be allowed to stand and pursue their terror. In this case when the fundamental constitution comes to mean more than just words on paper, we will find that the door to the Old World of mass genocide is finally closed, which in the present world is still dangerously open. 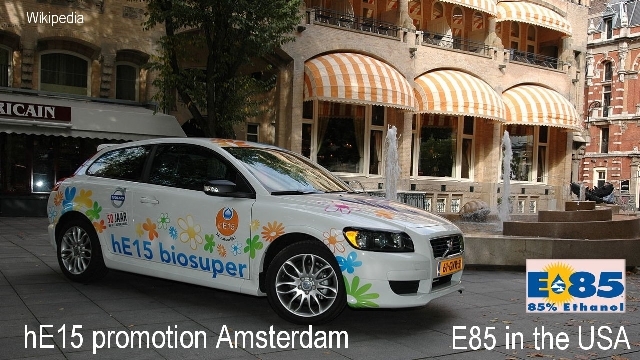 Depopulation genocide is presently implemented with the mass burning of food in automobiles that is starving 100 million people to death each year with society willingly participating in the process. 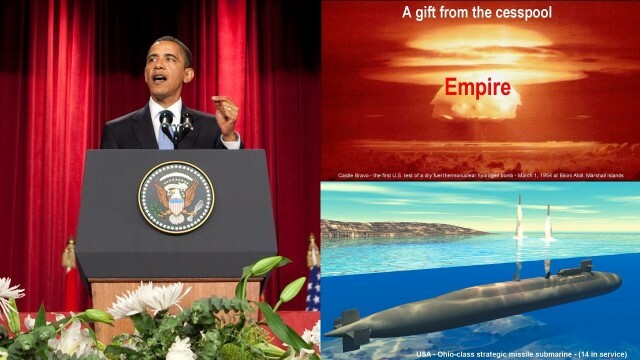 The green lies that are evermore deployed towards the shutting down of the world's energy resources, has the same deadly effect as a strike with the sword. The gate crashers demand the murdering of six billion people under the depopulation doctrine that defines humanity as but a herd of animals that the masters of empire aim to cull back to what they regard a manageable size for a feudal system. The gatecrashers are having a field day in the present world, because the fundamental constitution has been displaced from the heart. Who then speaks for humanity? ** Europe was unfamiliar with the fundamental constitution that had been pioneered in America as the Declaration of Independence. In the resulting void, when the gate crashers are allowed to stand, and stand in great numbers, civilization dies. 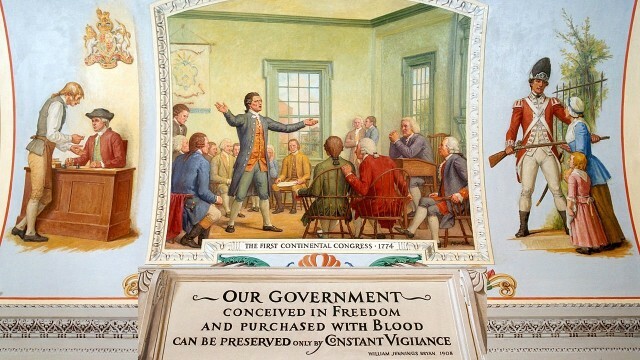 It dies of the most deadly disease at the deepest level that violates daily the most fundamental constitution in civilization that the American Declaration of Independence was designed to be for the world a living principle - a principle for living. However, the question also needs to be asked, especially in our time, whether or not the symbol that once stood for something tall and profound, lost its meaning. I would like to suggest that the principle of the fundamental constitution has not lost its power to shape the movements in society. In the real world the mind is the source of all movement, and this mind is still rooted in what is absolutely true. 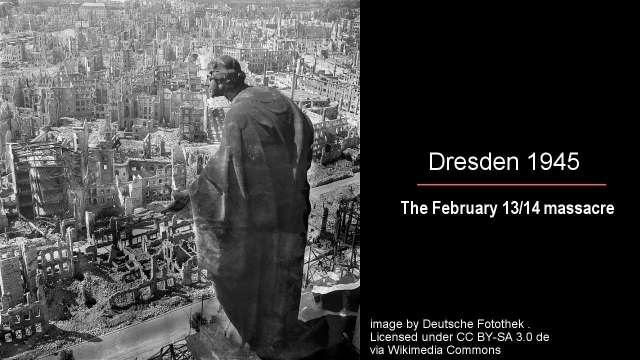 While it is true that when the heart dies, civilization dies of indifference unfolding into inhumanity, and that history is full of such examples, it is also true that in those parts of the world where the fundamental principles stand tall, the huge fascist tragedies tend to become prevented. 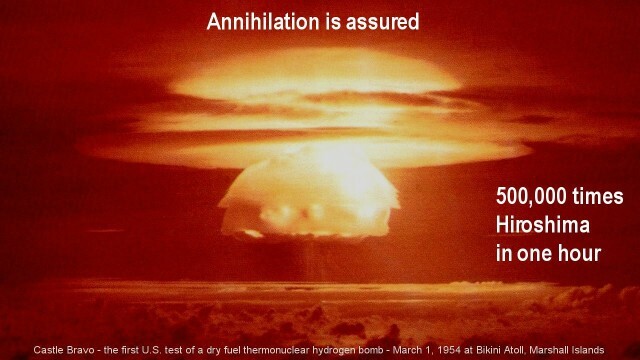 While, when civilization dies of inhumanity unfolding into the hardest hard-core fascism, all hope becomes lost, it is also a fact of history that a nuclear Armageddon has been blocked on a number of occasions, often in the final moments, often by American patriots, and in a few cases at the cost of the patriots' life. It is no secret that annihilation will likely result when the gatecrashers unleash Armageddon, so that defensive actions must occur before the deed is done, because nothing remains intact for reactive reactions to stop it. History tells us that a number of pre-active interventions have occurred. Nevertheless the threat keeps getting more intense and more difficult to block. This means that emergency healing of the heart is required. We need action fast. The clock is ticking. When the declaration that is symbolized here is more intensely heeded in society, it inspires its respective healing of the heart with which society rebuilds its sense of humanity from within. When this happens more fully, and only then, will all the gates be manned as never before. All the would-be gatecrashers would be blocked, including those who dared to plough through the gate, from the most boisterous bullies to their compliant slaves. Each one would be vacated from the landscape in an efficient manner that would assure that their intended great harm would never come true. But can we get to this point in our time? Yes we can, because humanity has healed itself before, at least in some degree, when it created the Golden Renaissance, and the Islamic Renaissance before it, and more recently the Jidish Renaissance. We are the diamonds in the universe. We are human beings. We have the power for self-healing. But how do we know that a healing is in progress? How do we know that we have made strides ahead? We know that we have gained a more profound sense of the vast dimension of the human being, when our science becomes liberated from the hands of the gatecrashers. 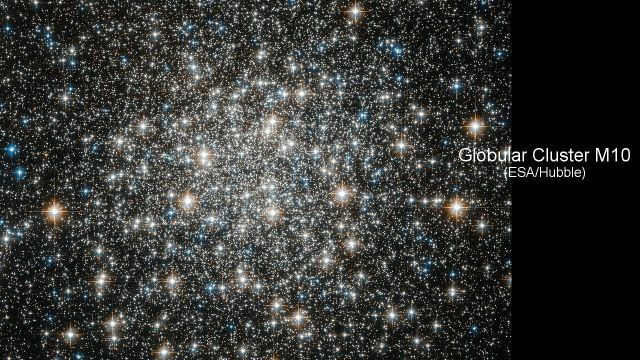 The liberty of humanity must extend into the sciences too, especially astrophysics. The light of reality is overlaid there with monumental trash that smothers scientific recognition, chokes the intellect, and keeps the hart confined with mythological dreams. The liberation of the truth on this front would change the thinking of the world. It wouldn't change reality, but it would bring it closer to universal recognition. 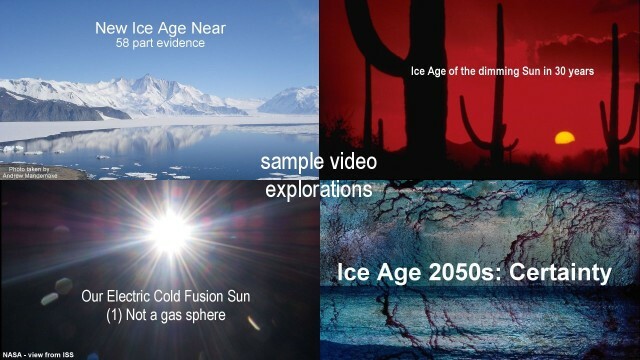 It would bring to light that a new Ice Age stands before us, potentially in the 2050s, in which the territory of many nations, from Canada, to Europe, to Russia, and parts of Asia and the USA, become quickly uninhabitable, so that the nations need to relate themselves into the tropics, with vast infrastructures being built that will make all this possible. The challenge will open the heart and humanity will give itself a new renaissance along the way to meet its needs. Once the gatecrashers are blocked that smother science with what is not, all of this becomes possible. I would like to suggest that this will happen, because the heart has a fundamental constitution to stand on and create itself a future with it. Yes, we as human beings, the people of the world, have the power to be what we truly are, a precious gem in the Universe. We, humanity, are after all, the creator of that great fundamental constitution that has not stopped to change the world from the day it was declared, which we still build on and move forward with. We are the diamonds in the sky, and we are this truly. Just look at the sky and search the vast realms of space, and ask yourself how many quadrillions of miles or millions of light years one would have to travel to discover life in distant places that is as grand as what we have right here in our human world, a world rich in beauty, sublimity, poetry, art, theatre, science, music, literature, love, creativity, productivity, culture. That's what the office of the gatekeeper is designed to protect from being drowned with trash, with the trash that is neither human nor intrinsically real in terms of what humanity is as the diamond of the Universe, or of God in the synonymous sense.